A Bruckner symphony arranged for chamber orchestra? That really shouldn’t work—but it does, and it’s a spectacular success. Jonathan Freeman-Attwood, principal of the Royal Academy of Music, is the brains behind the project, and top honors go to him for his astute choice of symphony and even more astute choice of arranger, the composer Anthony Payne. 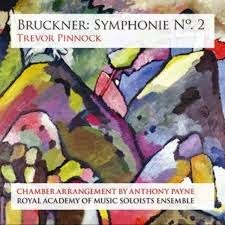 Add to that the arrangement itself, which is a triumph of clarity and timbral focus, an interpretation from Trevor Pinnock, who proves to be an insightful Brucknerian (who knew? ), orchestral playing from students who need fear no comparisons with the finest professionals, and exceptional SACD audio, and the result is an unqualified success on every count. The release is the second in a series called Reigniting Schoenberg’s Vision. The idea is to recreate—or even reinvent—Schoenberg’s famous Society for Private Musical Performances, performing some of the chamber arrangements of symphonic works made for those events, and even, as in this case, correcting Schoenberg’s omissions by adding to the repertoire. Bruckner’s Second “Symphonie” (as it’s referred to throughout the accompanying literature, a curious affectation) is a daring but smart choice. While it is not particularly small of stature, its identity, character, and charm emanate more from its quieter passages than from its climaxes. Payne follows the spirit more than the letter of the Schoenberg/Berg/Stein arrangements, using a 20-piece ensemble, larger than in any of the Vienna reworkings, but substituting the full orchestra in similar ways, particularly in the use of piano and harmonium to provide essential, although usually invisible, support. Some of the climaxes feel underpowered, but even here the pros of the arrangement outweigh the cons. We hear the stratospheric violin lines, the chugging bass figures, and the brass fanfares with a rare clarity. But it is in the quieter passages that this version really comes into its own. At the start, for example, the theme is given to the cellos. Here, we hear it as a cello solo, elegantly phrased and all the more beautiful for the sense of intimacy a single player can bring. In later passages, the bassoon writing is a particular revelation, and just as beautifully played. The opening of the Andante second movement, pared down to string sextet, is transporting in a way that only the very finest recordings of the full symphony manage. Some of the scherzo sounds a little hollow, but Pinnock and his small brass section ensure the momentum is maintained through finely calibrated accentuation. And in the finale, an appropriate gravitas is achieved, even in the absence of weight. Trevor Pinnock brings many of the preoccupations of the period instrument movement to bear on the work, yet it never sounds dry. Details of phrasing and accentuation are addressed in every bar, and the smaller ensemble allows him to shape and color accompanying textures with as much care as the main themes. His tempos are propulsive, but never rigid, nor excessively fast. He seems to be in a quandary over the caesuras. The tutti cut-offs don’t need the time to decay, but the severity of the mood changes often require a pause for reflection, which he always gives. The instrumentalists perform to an exceptionally high standard throughout. The playing of the string sextet is particularly impressive, highly expressive but finely controlled and balanced. So too the woodwind soloists, blending their tone in ensemble but taking full advantage of the increased exposure in solos to play with character and color. To all the other accolades for Jonathan Freeman-Attwood we must also add recording producer, another field in which he excels. The recording was made at St. George’s Bristol, and the sound is warm, but never excessively resonant. The clarity that Payne achieves in his arrangement is amplified at every step by the quality of the recorded sound. If I’ve one grumble, it’s the coupling, Alban Berg’s arrangement of Wine, Women, and Song. It follows hard on the heels of the Bruckner without any gap at all (not even time to jump up and switch it off) and it adds little. In comparison to Payne’s detailed and clear textures in the Bruckner, Berg’s arrangement feels bloated and unfocussed. Berg had a different acoustic in mind of course, and a different setting in every sense. Presumably this arrangement is included to highlight the link with the Society for Private Musical Performances, but it’s unnecessary. Whatever inspiration Freeman-Attwood, Payne, and the RAM musicians have drawn from Schoenberg is of only historical interest as far as this recording is concerned: The project needs no further justification than the exceptional quality of the results. This review appears in Fanfare Magazine, issue 38:1.